From Hurricanes Harvey, Irma and Maria to the wildfires that are devastating Northern California, it’s impossible to ignore the fact that the past three months have been rife with disasters. 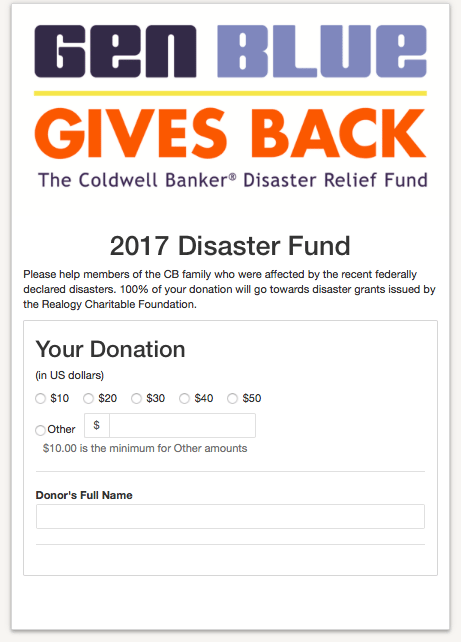 In response to the long recoveries ahead, Coldwell Banker is unveiling “Gen Blue Gives Back,” a relief fund implemented specifically for those in the Coldwell Banker network to donate to other employees, agents and brokers affiliated with the Coldwell Banker brand. Coldwell Banker will be making the official announcement on Oct. 17, during its annual “Generation Blue Experience” where 6,000 sales associates, brokers and owners will convene in Las Vegas. Cover repair or rebuild efforts (not covered by insurance) related to the primary residence. Cover loss of primary vehicle or rental cost not covered by insurance. Provide short term household assistance for the primary residence affected by the disaster. The four-step process requires applicants to provide evidence of damages through pictures, repair estimates, results of FEMA requests and the declaration page of pertinent insurance policies (noting deductible or denial of coverage). After the application deadline passes, an independent committee will review all submitted applications and begin dispersing funds. Those who would like to contribute to the fund simply have to fill out an online form and donate a minimum of $10. Donations can be made at https://www.cgiving.org/donate/CBCares through October 31.